Simply defined, a hazardous waste is a waste with properties that make it dangerous or capable of having a harmful effect on human health or the environment. Hazardous waste is generated from many sources, ranging from industrial process wastes to batteries and may come in many forms, including liquids, solids gases, and sludges. (EPA). At the University of Tennessee, laboratories generate waste hazardous chemicals and some facilities and operations groups may have used or excess chemicals that require proper disposal. EHS provides services and support to ensure hazardous wastes are disposed of properly. The following section provides some supporting documents. 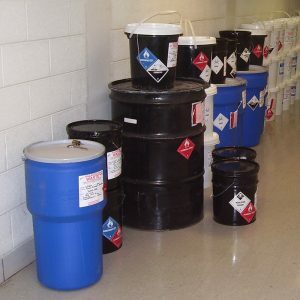 This guide details practices for disposing of materials such as empty chemical containers, glass, and sharps, as well as contaminated materials found in labs such as materials contaminated with chemical, radiological, or biological hazards.